Last week, I attended ECO Fashion Week in Vancouver and noticed how so many designers are thriving and creating beautiful clothes. I was lucky enough to speak with Amrita Sondhi, owner of Movementglobal. Amrita has been at the forefront of ECO fashion for a number of years. Last week, I attended ECO Fashion Week in Vancouver and noticed how so many designers are thriving and creating beautiful clothes. Recently, I was lucky enough to speak with Amrita Sondhi, owner of Movementglobal. Amrita has been at the forefront of ECO fashion for a number of years. Movementglobal clothes are made of bamboo. This unique natural fibre causes little or no environmental damage and it's long fibers are extremely strong, while having a beautiful soft hand. This fabric also breathes regulating the body's temperature. 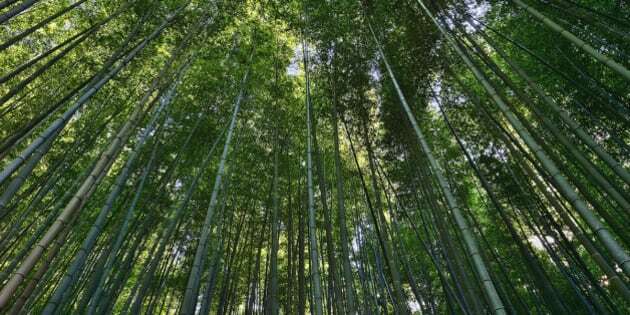 Bamboo is a sustainable fiber as it grows with no pesticides, uses very little land mass, and replenishes itself fast. Amrita shared with me what is on point for ECO fashion this season. "Movementglobal clothing is the 'anti-fashion' that sets us on the leading edge of a Fashion revolution. With our clothes we strive to make items that will last a long time. I design them so that they are durable not only in the high quality of fabric we use but also in their classic, yet forward style. Movementglobal designs are known for their great fit on numerous body types. " "They are easy to mix and match. By creating clothing that lasts a long time and styles that people love to wear, one of the large benefits is they have low environmental impact" says Amrita. Amrita adds, "The colours we have included recently are lavender, chocolate mix and espresso." The tones that match the earth are popular with Movementglobal. One of the styles that is on the rise are Gaucho pants. Great with layers and boots on rainy days and with a t shirt and flip flops in the summer. Fashion Tip: When wearing a wider pant it is a great idea to keep the top fitted to balance out the look. Pleated pants are making a comeback and Movement global has created a flattering adaptation of this style as our trousers lie flat. They have a fleece and jersey that is very elegant and on trend right now and made even more comfortable with thumb-holes. "Movement is all about a flattering fits, that never goes out of style," says Amrita. Many of the pieces in this collection are also completely reversible making the items even more eco friendly as less pieces are needed for your wardrobe. They are designed in such a way to give you lots of versatility and to allow for your own creativity. Bamboo is an easy fabric to take care of, simply wash in cold water and hang to dry. I will be thinking about all of these eco style tips as I continue to expand my spring wardrobe. Your suggestions are always welcome, as I continue on my journey to live life to the fullest. Let's have the very best 2015!